Ankylosing spondylitis (AS) is one disease found along a spectrum of inflammatory arthritis conditions that affect the spine and sacrum. The broader spectrum, known as axial spondyloarthritis (often written as "axial SpA"), includes diseases such as ankylosing spondylitis as subsets. These are diseases that affect the spine and structures that connect to it. The term "axial skeleton" actually refers to your trunk, skull, spine, pelvis, and rib cage. When spondyloarthritis affects the extremities, it is referred to as peripheral spondyloarthritis. Ankylosing spondyloarthritis is a rare but debilitating subset of axial spondyloarthritis in which the spine fuses over time. It is chronic and progressive. Risk is much higher if you test positive for the HLA-B27 gene, although scientists are not exactly sure of the role HLA-B27 plays in the process. So, what happens when you have AS? It generally starts with sacroiliac (SI) joint inflammation and stiffening. The SI joints are the joints between the sacrum and the pelvis. They are located on either side of the sacrum, which is the lowest section of the spinal column. Because AS is a chronic condition, the symptoms over time progress to other areas of the axial skeleton—namely your hips, vertebrae, and rib cage. 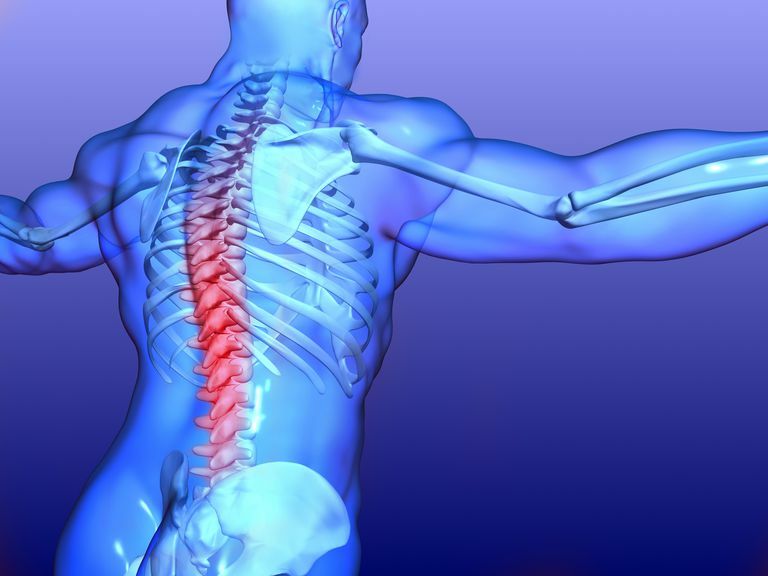 Ultimately, ankylosing spondylitis can result in a completely fused spine and total loss of spinal mobility. AS symptoms include early morning joint/spine stiffness and pain that is worse after rest (but feels better as the day goes on or after exercise). Fatigue, feverish feelings, and/or night sweats are also symptoms. Note that AS symptoms tend to come on slowly, often taking weeks or months to make themselves known. Some people find getting their ankylosing spondylitis diagnosed is a challenging or even frustrating experience. Ankylosing spondylitis, as well as other subset diseases along the axial spondylitis spectrum, sometimes shows up on an x-ray or MRI—but sometimes not. Often when a subset disease is "non-radiographic" (when there's no evidence of it on diagnostic imaging films), it's because the disease is still in an early stage. This could mean that signs may show up on future films—a good reason to keep monitoring them with your doctor. Radiographic signs are important because they help your doctor definitively diagnose AS. Getting a diagnosis is an important goal to work for—the sooner you do, the sooner you can start a treatment regimen that will hopefully be right for you. AS is often confused with rheumatoid arthritis, so before arriving at a conclusion about what's causing your symptoms, your doctor will have to distinguish between the two diseases. But, if diagnosed with AS, it is generally treated with drugs—a number of new ones are now on the market. Exercise may also help slow disease progression as well as manage pain and other symptoms. Deodhar, A., Reveille, J., van den Bosch, F., Braun, J., Burgos-Varga, R., et al. The Concept of Axial Spondyloarthritis: Joint Statement of the Spondyloarthritis Research and Treatment Network and the Assessment of SpondyloArthritis international Society in Response to the US Food and Drug Administration's Comments and Concerns. Sept 2014. Kiltz U., Baraliakos X., Braun J. Management of axial spondyloarthritis. Internist (Berl). Sept. 2016.